Season 2 is nearly over and it's clearly an intense photo finish. We have over 40,000 games being played in a day. This community is desperately trying to earn their season rewards and make it into the top 10 for glory and riches! It's amazing to watch! Thank you to all the incredibly enthusiastic fans that play this game all the time. The fear is that all the people playing are bots, but we had Holger who made the primary bot that's used take a look at the numbers. less than 10% of the fighting is bots. You guys are just intense and really dig it. I think you're competitive too, so obviously every time you lose it has to be a bot!!! Turns out it's just someone who likes this game as much or more than you and pipped your team! Better go back to the design room. With Season 2 about to finish it's time to talk about season 3. In the next season we're changing the way that the game is played. No longer are you facing an unknown opponent. You will know who your opponent is and the recent teams they used. Then it's up to you to make smart choices of what team to use to best defeat your opponent. That last part is more complicated because, as we noted in the last post, the conflict rules are going to change every single match rather than every 2 days. These changes have been really well received by the community so far, but unfortunately, due to the large scope of the gameplay changes, they will not be ready in time for the end of season 2 in a few hours. As a result, we have decided to delay the start of season 3 for about a week. You'll still be able to play ranked battles, move up the leaderboard, and get your daily quest rewards, but there will be no season rewards until the changes are ready and season 3 starts, which we hope to be no longer than 7-10 days from now. After season 3 gets started we're focused again on getting tournaments ready before the end of the year. That's the next major milestone we're working on. Once that's up and running and the bugs are ironed out we'll ramp up our marketing and advertising campaigns to try to bring in lots of new people to the game and to the Steem platform. 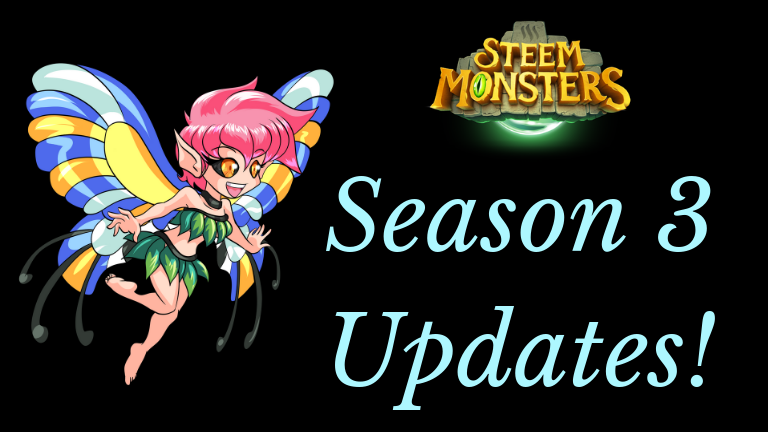 2019 should bring great things to the Steem Monsters and Steem community. Thanks for your ongoing support and looking forward to crushing you in season 3 in the near future!